Arrive at the Westminster tube station. Start walking in the direction of the Westminster bridge till the first traffic signal. Portcullis House is behind you and Victoria Embankment in front. Portcullis House: is home to the British Members of Parliament. It is not open for the public but one can gain entrance in the month of September at the London Open House Weekend. 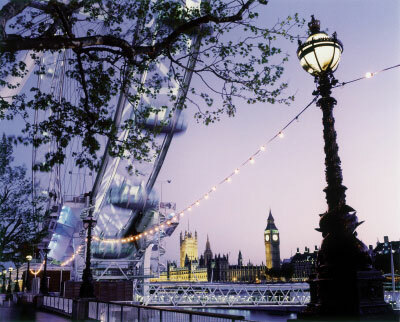 Victoria Embankment:: is the road and walkway along the north bank of the River Thames. The Victoria Embankment's construction started in 1865 and completed in 1870. This was the first street to have electrical lights in London. Ships that are permanently moored by Victoria Embankment include HMS President and HMS Wellington. Cleopatra's Needle: are a trio of obelisks in London, Paris, and New York City. Each is made of red granite, stands about 21 metres and weighs about 180 tons and is inscribed with Egyptian hieroglyphs. Although the needles are genuine Ancient Egyptian obelisks, they are somewhat misnamed as they have little connection with queen Cleopatra of Egypt. They were originally erected in the Egyptian city of Heliopolis around 1450 BC. The obelisks were moved to Alexandria in honor of Mark Antony — by the Romans in 12 BC. Sir William James Erasmus Wilson sponsored its transportation to London at a cost of some £10,000 in 1877. Walk down the steps adjoining the statue of Boadicea. The Westminster Tide Recorder: The green turret is the Westminster tide recorder. It is used to measure the depth of the Thames here. Looking across the river you will see a number of lions heads with steel mooring rings hanging through their mouths. Now these are not some sort of symbols, In fact they are performing a very important role, that of London's flood warning system. If the water were to reach the lions' mouths, this would mean flood level resulting in the immediate closure of the underground tube and Thames tunnels. Return to the Westminster station. Continue along till the corner of Parliament Square crossing over towards Big Ben. Houses of Parliament :The Houses of Parliament, also known as the Palace of Westminster is the seat of Britain's two parliamentary houses. Built in the 1040 this is the largest Gothic building in the world with 1,000 rooms. Parliament is open to all members of the UK public and overseas visitors. You can attend debates and watch committee hearings, tour the buildings or climb the famous Elizabeth Tower and see Big Ben. Big Ben: the most recognizable face of London. It is not the name of the tower, but is the name of the bell housed within the tower. The tower is open only to UK citizens for viewing through their Member of Parliament. Do be warned that the tower has no lift and there are 334 limestone stairs to the top. A light at the top of the tower is illuminated when Parliament is sitting at night. Turn around and face Parliament Square - built in 1868. On one of the corner of the square look at the statue of Sir Winston Churchill - Britain's Prime Minister during the second World War. The statue has a small charge of electricity running through it to keep the pigeons away. Westminster Abbey: The Collegiate Church of St Peter at Westminster, popularly known as Westminster Abbey, is a large, mainly Gothic church, in the City of Westminster. It was built by Edward the Confessor, and William the Conqueror was crowned in it in 1066. Thousands of people are buried, or have their ashes interred, in it. Many others have plaques. Kings, queens, statesmen and soldiers; poets, priests, heroes and villains are buried here. Cross over into St James's park keeping to the left and head towards Buckingham Palace. The Palace is usually closed to viewers, but you can visit its State Apartments for a fee of £19 in the summer months. Watch the Changing the Guard ceremony outside Buckingham Palace at 11.30 am daily in summer and every alternate morning in winter. Changing the Guard also takes place at Windsor Castle and at Horse Guards Arch on Horse Guards Parade. Next to the Palace is Green Park covering 40 acres. It lies between Hyde Park and St. James's Park..The park is said to have been a swampy burial ground for lepers from the hospital at St James's. Green Park has no lakes, no buildings and few monuments. The Park has featured in numerous movies: 101 Dalmatians, The Mother and The Importance of Being Earnest. Continue on the Queen's Walk until a small side street on the right. Take the side street to Cleveland Row. Continue on the Cleveland Row till St James' Palace which is on the right. Is the the official residence of the British Sovereign. The palace was built by Henry VIII on the site of the Hospital of St. James. Henry VIII's second wife, Anne Boleyn, stayed there the night after her coronation. After the destruction of the Palace of Whitehall, all monarchs until William IV lived at St. James's for part of the time.Queen Victoria was married at the Palace. St James's Street contains several of London's best known gentlemen's clubs, such as Brooks's, the Devonshire Club, originally Crockford's the Carlton Club and White's, some exclusive shops and various offices. Move up the hill along St James Street till Jermyn Street. Continue walking down the Street until Duke Street. Jermyn Street: dates back to 1664 when Charles ll authorised Henry Jermyn, the Earl of St Albans, to develop an area close to St James’s Palace. It has gained reputation as the centre for gentlemen’s fashion. Now it has London’s most famous retail brands including perfumery, jewellery, antiques and art, footwear, fine wine and food. Turn left from Duke Street or take a shortcut through Piccadilly Arcade up to Piccadilly. Piccadilly: The street is part of the A4 road, London's second most important western artery. It is the location of Fortnum & Mason, the Royal Academy, The Ritz Hotel and Hatchards book shop. There are also some offices and some very expensive flats. However, Piccadilly's appeal is compromised by being one of the widest and straightest streets in central London, and hence having some of the most overbearing traffic. Walk along Jermyn Street, crossing St James' Church, till Regent Street crossing. Take a left turn and trudge up the hill towards Piccadilly Circus. Piccadilly Circus: is a busy plaza in the heart of London at the junction of five major streets: Regent street, Shaftesbury Avenue, Piccadilly and Covent Street. The word 'Circus' refers to the roundabout around which the traffic circulated. The Piccadilly Circus is now partly pedestrianized and a favorite place from where to access the nearby shopping and entertainment areas - Soho, Chinatown, Shaftesbury Avenue and Trafalgar Square all within walking distance. Continue and take a right at Haymarket, crossing Burberrys, take a left along Cockspur Street. Continue walking past the National Gallery Sainsbury wing, tillthe National Gallery at the Trafalgar Square. Trafalgar Square: is a public space and tourist attraction in central London, built around the area formerly known as Charing Cross. It commemorates the Battle of Trafalgar (1805), a British naval victory of the Napoleonic Wars over France. Trafalgar Square is home to Nelson's Column, iconic stone lions, the famous Fourth Plinth and a lot of pigeons. On the north side of the square is the National Gallery and to its east St Martin-in-the-Fields church. To the south is Whitehall, to the east Strand and South Africa House, to the north Charing Cross Road and on the west side Canada House. It also has the four lion statues that guard the Column, Other statues and sculptures are also on display in the square, including a fourth plinth displaying changing pieces of contemporary art, and it is a frequent site of political demonstrations. Continue across Trafalgar Square till the statue of Charles I on horseback, cross Banqueting House till Horse Guards Continue to the gates of Downing Stree. Whitehall & Ten Downing Street :The Palace of Whitehall was the main residence of the English monarchs in London from 1530 until 1698 when all except Inigo Jones's 1622 Banqueting House was destroyed by fire. Most of the buildings alongside are Government Department buildings including the Ministry of Defence and the Foreign Office. 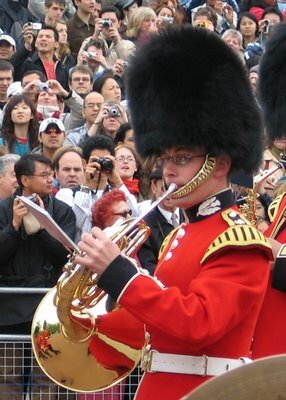 Horse Guards Parade, a big tourist attraction, is a parade ground near Whitehall used for royal parades and ceremonies. Every morning the ceremony of Changing of the Guard takes place at Horse Guards Parade (11:00 Monday - Saturday, 10:00 Sunday). Trooping the Colour is held in London annually on a Saturday in June, Queen’s official birthday though her real birthday is April 21. 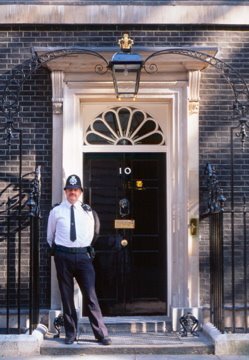 Downing Street is named after Sir George Downing, the second graduate of Harvard College, who bought the land and built the houses in 1680. Number 10 has been the official residence of the Prime Minister since 1732. Public is not allowed in. Continue along Whitehall to Parliament Square and turn left. Walk along Bridge Street, back to your starting point outside Westminster tube station.